Line D in New York's subway (part of the 6th Avenue line, part of the Queens Boulevard line, part of the 8th Avenue line and the Concourse line, all former IND), for the classes R-68 or R- 160 subway trains. This line begins at a layup track at Norwood/205th Street in the Bronx and goes to via Manhattan to Coney Island in Brooklyn. The team behind this route provides a well-done and beautiful simulation of the highest class. Stations, trackside objects and the urban environment are detailed. Soft curves and realistic switches, announcement of stations and connections. Everything on the Concourse line. Everything on the 8th Avenue line. Everything on the Queens Boulevard line. Everything on the 6th Avenue line. 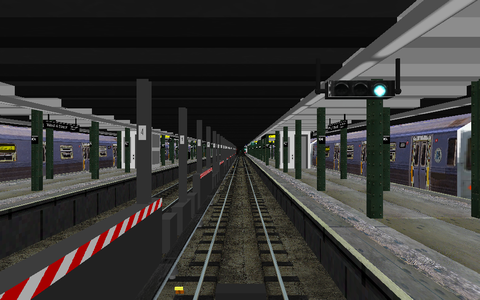 Route, object and sound files at BVEstation, Line F at BVEstation from which the object directory IND Valley Stream is needed.